A suspicious vehicle trailed a motorcade carrying Malia and Sasha Obama onto the White House grounds on Tuesday before being pulled over and searched, sources tell NBC News. A Secret Service official said the incident occurred about 4:40 p.m. 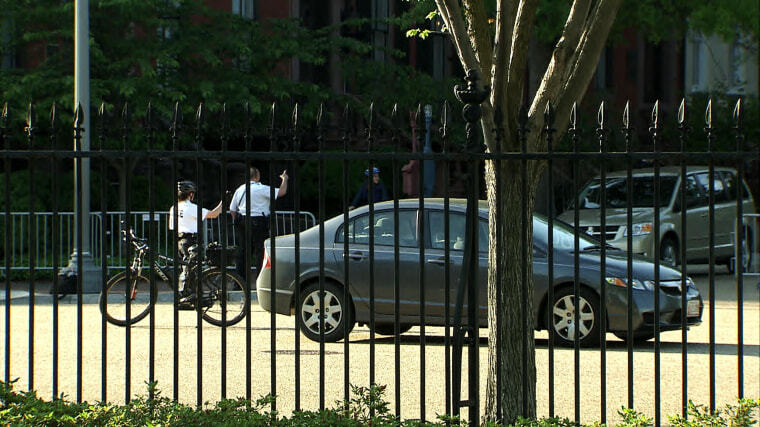 ET, when a car followed the motorcade through the White House entrance at Pennsylvania Avenue and 17th Street NW and was immediately pulled over by Secret Service agents. The official, who spoke on condition of anonymity, said the male driver was taken into custody and officers from the Metropolitan Police Department were responding to sweep the vehicle. It was not immediately clear whether it was a mistake or intentional. Pennsylvania Avenue remains closed off to pedestrian traffic and reporters remain locked down inside the White House. An "all clear" was issued in the White House shortly after 5:30 p.m., but the nature of the incident was not immediately clear. Sources told NBC News the motorcade was carrying the president and first lady’s daughters back to the White House.